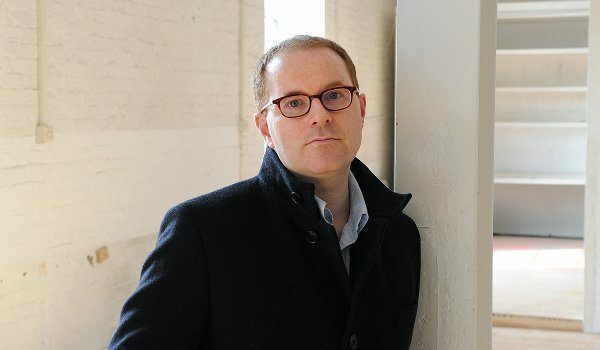 In April 2013, I met Conor Mc Pherson in Covent Garden, London to discuss the then upcoming revival of his play The Weir, as well as his latest new work, The Night Alive. McPherson was great company, open to discussing anything, as we looked back across his fine career. We also discussed his alleged questioning of fellow playwright Martin McDonagh’s Irishness, which did not make the final feature but can be found as a news story here. An edited version of this article appeared in The Irish Post that June. CONOR McPHERSON was 29 when his pancreas ruptured. Twelve years later and a now sober McPherson is back in London. The Night Alive, his twelfth theatrical work, will be performed on-stage for the first time next week. Although nobody has yet seen it, its seven-week run is long since sold out and follows a just completed — and hugely successful — revival of his most revered work, The Weir. It’s during rehearsals for that supernatural-influenced play that we meet on an overcast April afternoon in central London. McPherson, now 41, is not long off a flight from Dublin. The Covent Garden rehearsal room where he’s busily at work is in keeping with how one would picture such a working environment, all large, open-planned spaces bordered by gleaming white walls and huge windows. Sat within a glass-panelled office off to one side, as if on exhibit, is McPherson. Dressed in a light blue shirt, unfussy jeans, and black, working man’s boots, he cuts something of a spooky figure, his ghostly pale complexion off-set by his bright, tightly-cropped ginger hair. Next door, the cast of The Weir, actors Ardal O’Hanlon, Brian Cox, Dervla Kirwan, Risteárd Cooper and Peter McDonald, are taking lunch. McPherson has spent the morning with them. He’s been looking in on their rehearsals, answering questions and generally offering his seal of approval to a production he otherwise has little involvement in outside of the marvel of words he committed to page 16 years ago. Instead his focus remains very much on the June 13 premiere of The Night Alive, which, like all first productions of his work, he will also direct before essentially washing his hands of the play and moving on to the next thing. In conversation, McPherson is a quietly intense interviewee with perfect conversational manners. Each question is taken in respectfully and attentively. There’s no fidgeting, gazing to the floor or signs of distraction. Only in the seconds between question and answer will he sip his tea before responding in his soft-spoken, direct and honest manner, all the time his blue eyes fixed intently upon you. Born the son of an accountant and a housewife in north Dublin in August 1971, he began writing plays in the early 1990s as a student in University College Dublin. A philosophy graduate, he was heavily involved in the university’s drama society, DramSoc, and went on to set up the Fly By Night Theatre company in 1992, while still in college, with some fellow students, including actor Peter McDonald. His first notable work, the monologue Rum & Vodka, was staged in 1994 but it was 1995’s This Lime Tree Bower (again self-produced after being turned down by every major theatre in Ireland) that brought him to the attention of the London theatrical world. It was London — and not Dublin — that first truly recognised his talent. The Bush Theatre made him their writer in residence in 1996 and it was here that he wrote 1997’s St. Nicholas, starring Brian Cox, and began work on The Weir, the play that was to change everything. Booked to play for just three weeks in front of an audience of 60 people a night at The Royal Court Theatre Upstairs, The Weir took the capital’s theatre critics by storm and garnered huge acclaim for the then 26-year-old playwright. Transferring to the West End, where it ran for two years, the whirlwind of success took the production to Broadway in 1999 and earned McPherson numerous awards along the way. He had truly arrived. 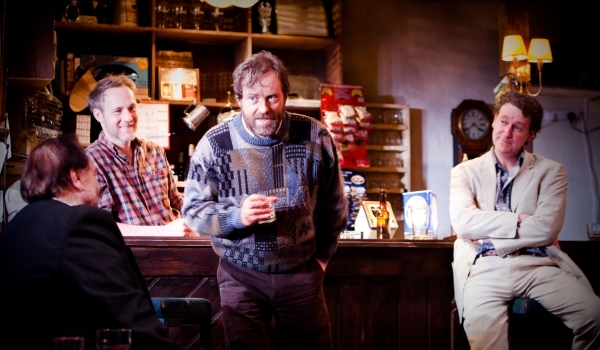 The phenomenal success of The Weir, a play set in an Irish country bar involving four men and a woman exchanging ghost stories, had been unexpected in every sense. Having had no profile in his native Ireland, McPherson seemed to come out of nowhere to become the darling of the world’s biggest theatre stages — the West End and Broadway. The sudden success of The Weir brought with it the pressures of expectancy and with that came an added dependency on alcohol. Although at the time he wasn’t consciously reflecting what was going on in his life, looking back McPherson is able to trace the imprint of his mood at the time on his work. In dealing so overtly with the misery of alcoholism in Dublin Carol, at a time many assumed would be amongst his happiest, was he consciously aware he had a drink problem? If he acknowledges that his work ends up being reflective of his life, he says that this is not a conscious decision. Although the common thread of his plays is death, betrayal, alcoholism, regret and the supernatural, he never sets out to tackle a particular subject or theme. “The play ends up being what it’s about because that’s what it’s about,” he says, “but I don’t really know that at the beginning.” Instead, he professes that the whole creative process remains “a mystery”; that the ideas begin in his mind’s eye with a glimpse of “a world in a room”. The new work will be staged in the shadow of a major London revival of The Weir, which reaffirmed that play’s status as a modern classic and has teased anticipation for The Night Alive. It’s something of a bold move that invites debate as to whether McPherson ‘still has it’ or if he’s already peaked. “As you get older I think that you have to entertain that possibility,” he says when asked if he might have already written his greatest work, “because, who knows? Your next one — you’re always hoping — is going to be your best one because you’re like, ‘I’ve finally figured this out’, but then of course you look back and go, ‘Well actually, when I didn’t know my arse from my elbow I was writing plays which everybody really liked’. So, does learning anything make you a better playwright? Maybe not. Maybe it makes you a worse one. But I don’t really think of it so much like that. I think everybody who is creative is always looking forward, really, because, as I say, that’s where the perfect work is. Everything else is a sort of flawed attempt to bring a dream alive and your past is littered with those attempts. But you’re still hoping that you’re going to reach that place where you’re going to nail the dream.” For his next work, McPherson has “a few different ideas floating about”. Filming has just completed on his adaptation of one of John Banville’s Benjamin Black novels for the BBC series Quirke. It’s his first foray into television following four movies.